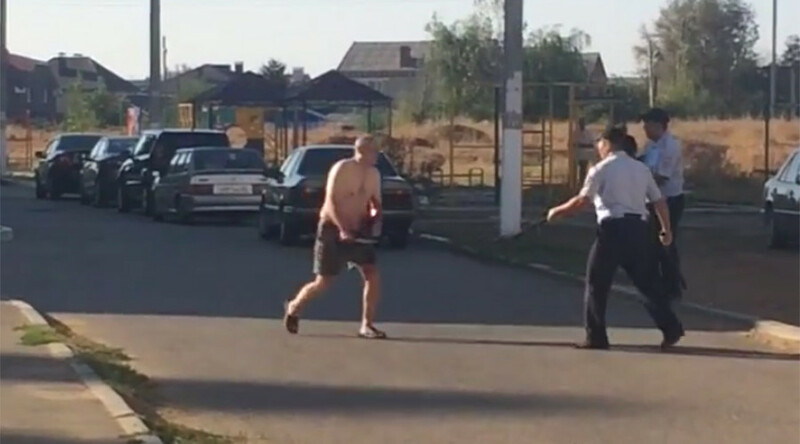 A man armed with a huge knife was filmed in southern Russia in a tense standoff with cops. Media said he had been wandering the streets after killing the baby daughter of his niece and injuring the mother. Police had to use firearms to arrest him. The tragedy happened Tuesday morning in the city of Astrakhan, home to over half a million people. The 42-year-old man attracted macabre attention by his grisly view: dressed only in shorts and boots, he had a big bloodied knife in his hand, and blood covered his arms. Worried residents called the police, local news channel Astrakhan 24 reports. The man resisted attempts to seize the weapon and threatened officers, footage of the altercation showed. The cops eventually shot the man to disable him. The subsequent investigation confirmed the worst suspicions about why the man was covered in blood. Before wondering into the street, he had attacked his niece and her baby daughter with the knife in their apartment, the local media said. The 18-month old infant was killed while the mother was taken to hospital in serious condition, according to the police report. The British tabloid Daily Mail reported the tragedy, citing eyewitnesses’ claims that the man cut off the baby girl’s head and brandished it while stumbling around in the street. However, footage of his arrest does not corroborate this claim, and neither do reports in the Russian media. The man was identified as Mikhail Elinsky, a local resident with a criminal record. Six years ago he killed a shop assistant in a drunken rage, authorities confirmed. The court then ruled that the man should undergo mandatory treatment in a secure psychiatric ward because he had been diagnosed with paranoid schizophrenia. Astrakhan-24 TV says the man was released from custody a month prior to the tragedy. His mother, Valentina, told the channel that Elinsky looked stressed and irritated for about two days before his violent rampage. “He went to the shop to buy some food, he was in a good mood after getting released… But two days ago he became thoughtful and I even… I look at him and say ‘Misha, why’s all this thoughtfulness?’ And he says: ‘Well…,’” his mother told the channel. On Tuesday evening, Elinsky died in hospital, succumbing to the shooting wound from the police.